7/48 Les Winan Politics aside, this is a terrific documentary. Politics not aside, this should be required viewing for every voter. 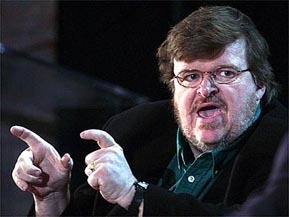 Nice to not see too much of Michael Moore. 11/55 Reagen Sulewski Controversial, and with a distinct voice, but what interesting documentaries aren't? 16/92 David Mumpower How many letters do you think Moore gets a day that are marked "Not Anthrax, I Swear"? 23/126 Kim Hollis Brutal and uncompromising, Moore's political commentary speaks volumes. Michael Moore, Academy Award-winning documentarian, is, to put it mildly, not one of Dubya’s biggest fans. And there is a goodly segment of the population - some of whom have never seen one of his films - who, to put it mildly, are not Moore’s biggest fans. So with the announced subject of Moore’s next documentary being the Bush Administration’s actions in the aftermath of the World Trade Center attacks, it’s a pretty safe bet that the film will be controversial and some folks are gonna get all riled up over it. And there does seem to be no middle ground when it comes to Michael Moore. Folks seem to think he’s either an honest and passionate filmmaker who strives to shine a klieg light on things other people are either unaware of or flat-out ignore; or that he’s a partisan gadfly who skews the truth and is not above editing his documentaries so they only contain footage that bolsters his tenets. Be that as it may, however, both sides would (in some cases reluctantly) have to concede that Moore uses his camera as the proverbial unblinking eye, allowing his subjects to exonerate or damn themselves. Over the length of his career, Moore has done more to bring documentaries into the public consciousness than any filmmaker whose last name isn’t Spielberg. Rather than being dry treatises that put the audience to sleep in a matter of minutes, Moore infuses his docs with humor, compassion, and that special kind of wonder that comes from watching people doing and saying things that make rational people think, “Huh?”. And to his credit, Moore does not shy away from divisive subject matter, something that is a bit out of the norm for a filmmaker whose overall tone is bemusement. Anyone who watched the Oscar ceremony in 2003 knows that Moore does not support the invasion of Iraq or the Bush administration. And given the recent revelations regarding how Dubya allegedly responded in the early days after the World Trade Center attacks, Moore has basically sent himself into a minefield, albeit one he likely relishes. While it is doubtful he will be able to gain access to the key Administration players - especially since this documentary is currently scheduled to be released before the November elections (at the moment, the film is slated for a September release date) - it will be interesting to see who Moore is able to personally interview, and the shape that the film takes as he peels back the layers of PR and disinformation to reveal the core of the matter.